Crawley Town say they are close to agreeing a takeover with an overseas-based business consortium and hope to finalise the deal in early February. The League Two club have been in talks with the group - which BBC Sussex reports is European - since October. A club statement said: "The board and Paul Hayward, our benefactor, have been looking for fresh investment since 2013 to help take the club further forward." The West Sussex club were first put up for sale in March 2013. The Reds were then in League One and were looking to gain the "further substantial funding" needed to win promotion to the Championship. 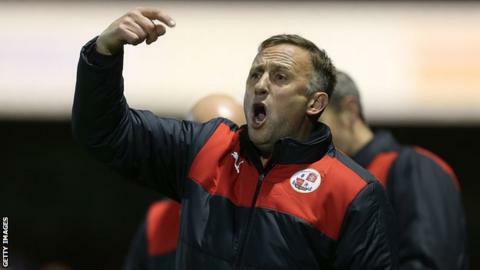 But last season Crawley were relegated to League Two, with Mark Yates then appointed as their new manager. The statement continued: "Subject to the ratification of legal agreements and Football League approval being granted, the club hope to be finalise the takeover early next month. "The board firmly believe that the consortium have the ability to build on our achievements to date." The continued talks mean no new signings are likely to be made before Monday's transfer deadline. Speaking after Saturday's 1-0 home defeat by Mansfield Town, Yates added: "The players can't do anything about it, but we must find out what is going on as quickly as we can. "The sooner that gets cleaned up the better. The group needs some fresh faces." "The club is desperate for new investment after a glorious rise under the current owners took them from non-league status to the third tier of English football. "Attendances never quite sustained the budget required to compete at that level, and last summer they were relegated back to League Two. "It's not clear what any of this means for the likes of chief executive Michael Dunford, or indeed manager Mark Yates." Can Pato revive career at Chelsea? Read more on Alexandre Pato: Can Brazil forward revive career at Chelsea?